For other uses, see Eric (disambiguation). Eric Kaplan is a former writer for Futurama. 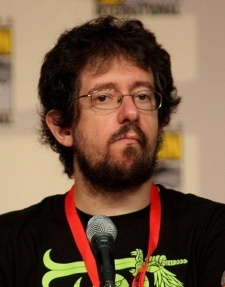 He has also worked on Malcolm in the Middle, The Drinky Crow Show, The Late Show with David Letterman and The Simpsons. He also runs Mirari Films and created the webcomic "Zombie College". The animators have used him as a character twice, in the episodes "I Dated a Robot" and "A Bicyclops Built for Two". Both appearances were on the Internet. This page was last edited on 15 February 2016, at 21:10.